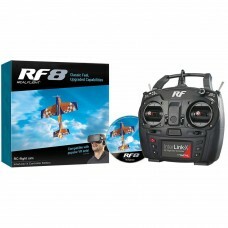 Classic convenience meets enhanced capabilities in RealFlight 8! It brings back all the features and functionality of RF7.5 with several key upgrades. The same game-changing, supremely realistic physics which have drawn pilots to RealFlight since the first edition are back and further improved… and there's so much more. First up on the list of new capabilities—VR compatibility. Plug in a popular VR set available on the market and you're instantly at the field or behind the sticks. For full immersion, there's nothing else like it out there. Plus, accessing the world of RealFlight is easier than ever with a simple, intuitive interface which virtually guarantees you'll be up and flying in moments. There's zero learning curve, zero hassle, just flying fun. New for RealFlight 8, you can fly with the custom-designed InterLink controller or hook up a game console controller you might already have around the house. Far from last, and certainly not least, the game-like challenges which have helped sharpen thousands of pilots' skills are back and expanded so you get more tiers of balloon-popping, spot landing bang for your buck. Available with the InterLink-X controller, or software only. Compatible with some VR sets (available separately) check manufacturers requirements for VR system use.